Nigeria’s leading carrier, Air Peace on Friday set a new record with the arrival of its newly acquired Boeing B777-200 aircraft, becoming the first and only Nigerian airline to procure and register the brand of the airliner in the country. The development is coming weeks after the airline took delivery of two Embraer 145 aircraft on January 31 and February 9 respectively and made history with the setting up a subsidiary, Air Peace Hopper to organise its short-haul operations in line with its no-city-left-behind project. 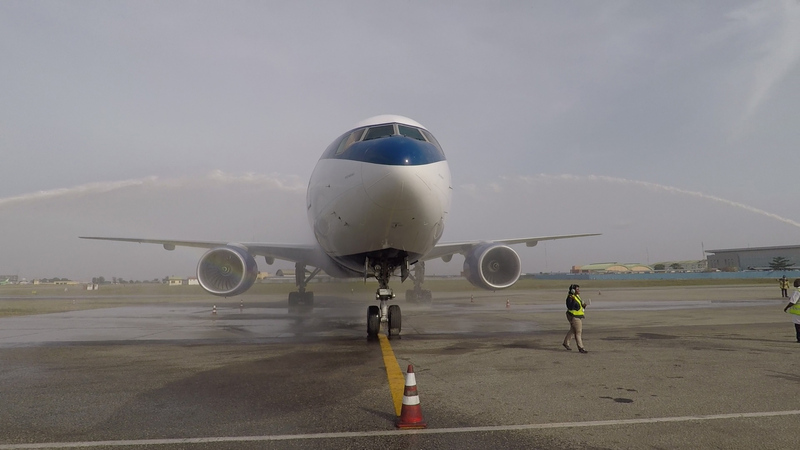 The 274-capacity aircraft, which touched down at the Murtala Muhammed International Airport, Lagos at about 3.45 pm on Friday, is the first of two Boeing 777 airliners Air Peace recently acquired in preparation for its Dubai, Sharjah, London, Guangzhou-China, Houston, Mumbai and Johannesburg services. The airline is finalising talks to add two more B777 aircraft to its fleet soon. 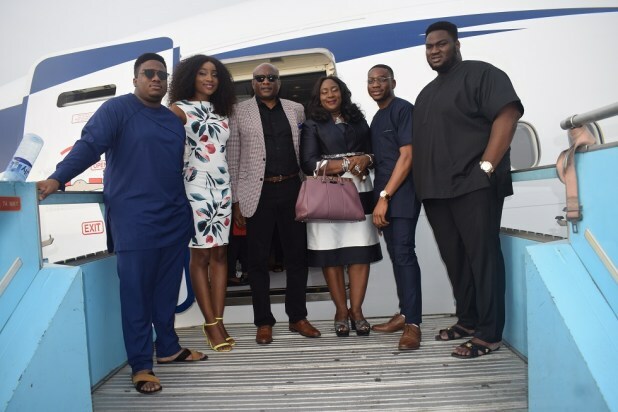 The aircraft with registration mark 5N-BVE bears “Ifechukwu”, the middle name of the Chairman/Chief Executive Officer of Air Peace, Mr. Allen Onyema. The aircraft, which was flown in by the Chief Pilot of the airline, Capt. Victor Egonu and Capt. 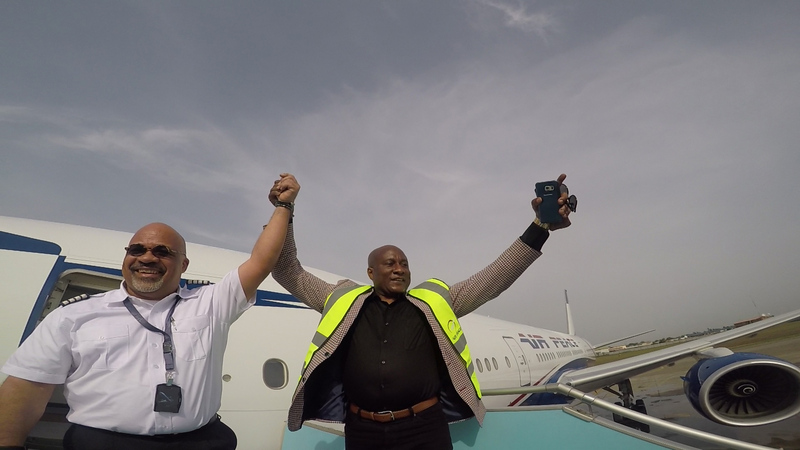 Simon Donoghue, arrived to a rousing welcome by an excited team from Air Peace led by Onyema and and enthusiastic crowd of top aviation personnel as well as security operatives. Speaking on the arrival of the aircraft, Onyema assured that Air Peace, which launched its Banjul, Freetown and Dakar services on February 19, would soon start flights to Dubai, Sharjah, Guangzhou-China, London, Houston, Mumbai and South Africa. “Air Peace is ready to begin operations on these routes as soon as we get the cooperation of our aviation agencies, our home governments, and the outside governments of the countries we are going to. As soon as we get their cooperation, we will make it happen, ” Onyema said. The feats Air Peace had recorded in just three years of its flight operations, he insisted, were a proof that Nigerian airlines could compete with and even outperform the legacy airlines if there was a level-playing field. His words: “This is the first time a Nigerian carrier is acquiring a B777. What we have had in the past were through leases which were not favourable to the airline operators. So, I don’t believe that Nigerian airlines cannot compete favourably with others. What we have been lacking is the necessary support. Onyema dismissed insinuations that Nigerian airlines were not safe, stressing that Air Peace spent up to $2.5 million annually in maintaining a single aircraft on its fleet. “So,” he contended, “in terms of safety, we can assure our guests of the very best because even our technical partner is a firm from the United Kingdom. The Air Peace boss said he remained opposed to the Single African Air Transportation Market (SAATM) initiative, insisting that Nigeria had little or nothing to gain from it. Onyema explained that most African airlines that would take advantage of the SAATM window to operate in the country lacked attractive destinations Nigerian airlines would reciprocally operate into. He added that some of the countries on the African continent were imposing high charges in a bid to discourage Nigerian airlines from operating into their routes.